Crafted for the 2017-2018 Capstone Engage Literacy Advance program, Why The Moon Moves Away is a 64-page, GRL V porquoi tale answering the age-old question of where the moon came from and the more recent question of why, year after year, the moon moves a little farther away from the Earth. 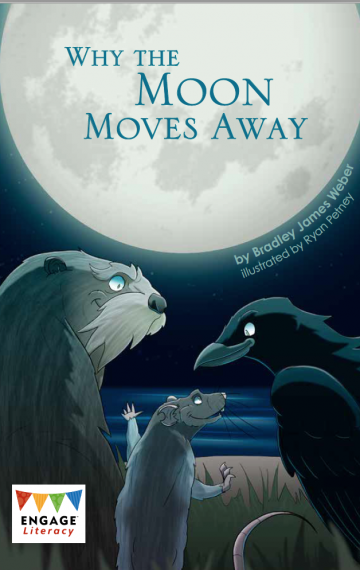 After a storm washes up a gigantic oyster, Rat, Raven, and Otter are deciding what to do with it when Bear and his pal Crocodile wander along. Rat, seeing the only way into the shell is with Bear’s help, strikes a deal so they each get a share – but Bear splits the meat with Crocodile before finding the oyster’s huge pearl. Thinking it’s more food, Bear tries to crack it open, but can’t. Crocodile crushes it in his teeth, but only puts dents and craters in it before the pearl sticks in his throat. Bear pounds Crocodile’s back then squeezes him around the middle until the pearl gets coughed up and flies into space — thereby becoming the moon that continues to move further away from the world.